Nurses and other union members are pushing for fair contracts and patient safety at UC Davis. 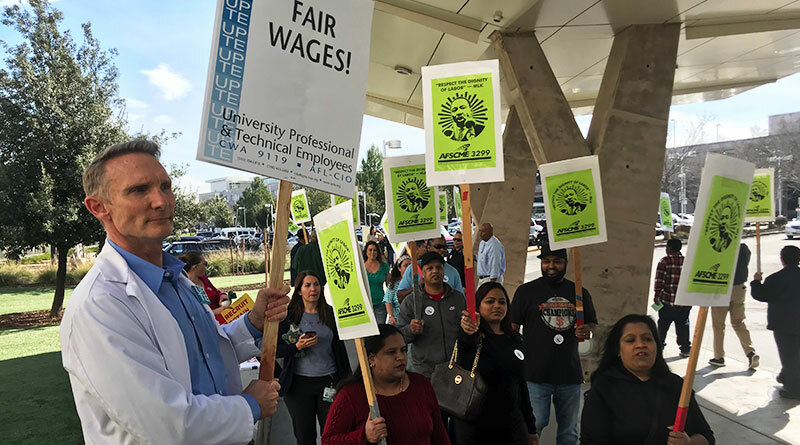 Members of the California Nurses Association were joined by other unions in February to fight for patients’ rights and fair working conditions at the University of California at Davis. In Sacramento, nurses were joined by members of AFSCME 3299, UPTE and the Sacramento Central Labor Council for a rally at the Medical Center near Oak Park, where nearly 400 people turned out in support. Nurses have been working without a contract at all University of California facilities since September. AFSCME 3299 and UPTE are also in contract negotiations, and AFSCME Patient Care Technical workers have been out of contract since the end of last year. The California Nurses Association/National Nurses United represents about 14,000 RNs throughout the state at the five major UC medical centers, 10 student health centers, and the Lawrence Berkeley National Laboratory. The Sacramento rally was part of a statewide action that included Los Angeles, San Monica, San Diego, San Francisco and other sites. Several proposals by the nurses – that have met with resistance from the university – would provide important upgrades in quality of care, including nurse staffing based on patient illness, not budgetary goals, protection from unsafe assignment of nurses to clinical areas where the registered nurse does not have specialty expertise, and dedicated nurses to assure their co-workers can take needed meal and rest breaks, the union said. On workplace safety, the registered nurses seek strengthened language to make UC compliant with state laws that require workplace violence prevention plans and proper patient handling policies to prevent patient falls and accidents and nurse injuries, as well as improved protection for nurses from exposure to infectious diseases and hazardous substances. By contrast, UC officials are demanding elimination of protections from mandatory overtime which would force more registered nurses to work when fatigued at risk to patients and themselves, elimination of the right for nurses to bargain over health benefits and sick leave, reduced retirement benefits, and unwarranted changes in nurses work schedules. Among the main concerns of nurses in Sacramento are safe staffing levels and retirement with dignity. Nurses want to see the university provide higher staffing levels that allow, among other things, enough nurses to be on duty to allow them to take breaks without lowering levels of care. Nurses currently have two weeks’ notice of scheduling changes, but UC wants to lower that to only a couple of days at most. Providing a secure retirement is also a concern. Currently, registered nurses now get a full pension at age 60, but the university wants to raise that to age 65 and give incoming nurses the choice of a pension or an opt-out to a 401K plan.